So, if the Accidental Locavore was going to jump off my self-imposed, post-hot chocolate, abstinence-from-sugar-white-flour-white-foods-and-other-carbs, Café le Perche seemed like a great place to do it. It’s a labor of love disguised as a bakery. According to the NY Times, the owner, Allan Chapin, fell in love with a baguette in France and decided to replicate it in upstate New York – not a simple task. He bought a 17-ton brick oven and had it and two French masons shipped over here. 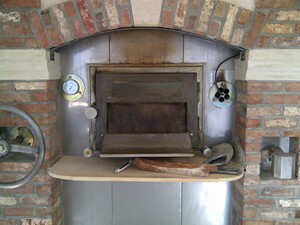 The oven itself is almost unassuming, until you get a look inside the (smallish) door and see that it’s just huge—about 10’ in diameter! Then he went about trying to replicate the flour that makes the French baguettes so superb, also a daunting mission. He hooked up with Wild Hive Farm (known to my friends as the “hippie café”) to create a local blend that would be on an equal footing with the French. Since my husband and I are suckers for anything (pick one, or all of the above) French, local, or food-related-labors-of-love, planning a day trip to Hudson NY didn’t take much discussion. It’s about an hour’s drive from our house upstate, through some lovely farm country. If you don’t know Hudson, it was one of those long-forgotten towns that about ten years ago was re-discovered by antique dealers and since then has turned into a cute (if touristy) town bustling with antique shops, home furnishing stores and some good restaurants. After wandering around Warren Street, the main shopping street, we walked down to the end of it and into Café Le Perche. 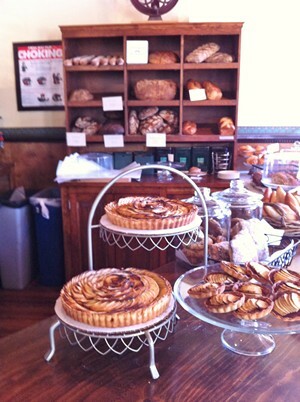 While the Locavore wouldn’t say it was a dead ringer for a French boulangerie, it was a lovely, warm bakery. A wall on the side had an array of great-looking bread and the front marble counter was massed with tarts, croissants and (trés Americain) cookies. There’s a large café in the back with a wall of windows looking out over the carriage house that holds the oven. We ordered a couple of sandwiches, coffee and tea. 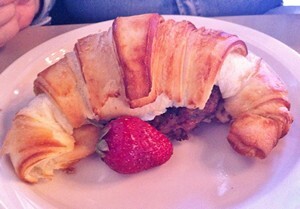 Frank had a croissant stuffed with local sausage and scrambled egg. It was a wonderful croissant, flaky with a good yeasty taste. 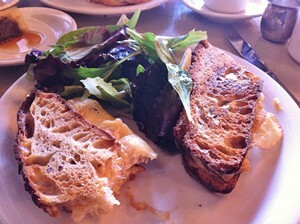 I had a warm roast pork sandwich with smoked Gouda on their rustic bread. The pork was really moist and tender with a great strong Dijon mustard crust and the bread, of course, was terrific! Ashley, our waitress, although really busy, happily took us out to show us the oven and then filled up a big sack with croissants and a baguette (of course) to take home. The verdict? Wow, it was an awfully good baguette! Great flavor (which not all baguettes have, even in France), good crust…. Simply great bread. We had the ham and cheese croissants the next morning for breakfast. Frank thought they were really good and he liked the touch of Dijon in them. I thought they were good but not great, possibly because the Dijon drowned out the yeasty taste (I’m assuming) of the croissant. This weekend, we’ll happily attack the plain croissants and report back. In the meantime, if you’re looking for a fun day trip from Manhattan with a great baguette at the other end, head up to Hudson and check out Café le Perche. My guess would be that they run out of baguettes and croissants when the weather is nice so you might want to make it your first stop.